Hidden from public view amid 21⁄2 acres of wonderful gardens and grounds just north of St Mary’s Church, The Old Rectory, London SW19, is not only Wimbledon’s best-kept secret and its oldest inhabited building, but, following its launch onto the market by Knight Frank (0208-946 0026) at a guide price of £26 million, the most expensive house ever offered for sale in the borough’s 3,000-year history. For more than 500 years, this remarkable Tudor building has known alternate periods of grandeur and decline, but, after an inspirational restoration by its current owners, it now offers the ultimate in elegant country living, a mere 20 minutes from the heart of central London. Built by the Church as a parsonage in the early 1500s, The Old Rectory reverted to the Crown in 1536 after the Dissolution of the Monasteries. Henry VIII stayed there in 1546 when he was taken ill during a tour of his Surrey palaces, but, by then, he was too bloated to make it up the stairs, so a bed was installed for him in front of the fireplace in what is now the grand entrance hall. Henry died in January 1547, and, that same year, ownership of The Old Rectory was transferred to the Dean and Chapter of Worcester Cathedral, who leased the house to successive lords of the manor. 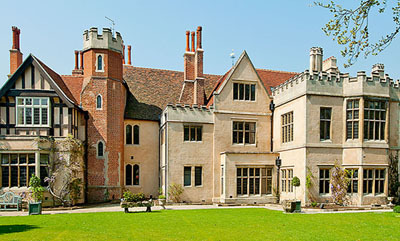 In 1550, the house became the country retreat of one of England’s most powerful statesmen, Sir William Cecil, later 1st Lord Burghley, senior adviser to Elizabeth I. Described with masterly understatement by one of Cecil’s biographers as ‘not luxurious, but adequate’, a survey of the building from 1649 describes a two-storey house with a large dining hall, a withdrawing chamber, a parlour and little chamber (possibly the present chapel), and extensive service quarters. A spiral staircase gave access to a first-floor corridor with 10 chambers and five closets, with five garrets in the roof. All of this suggests that the 16th-century Rectory was a much larger building than the surviving Tudor portion of the present house. The Old Rectory was the first great house to be built in Wimbledon until, in 1588, William Cecil’s son, Thomas, built himself a grand new manor on the hill to the east of the rectory, which was later demolished, in 1717. Thereafter, the importance of The Old Rectory declined and, by 1720, it was known as The Old Laundry House. It was reportedly uninhabited when Sir Theodore Janssen took over the lease, pulled down the south wing and restored the remainder of the building. When the Spencer family took over the manor some years later, the Rectory, which was connected to the manor by an underground tunnel, was used first as a dairy house and then as their agent’s house. He died in 1802, but there are no records of any other occupants until the house was sold by the Dean and Chapter as a near ruin to John Augustus Beaumont in 1861. Beaumont was already developing the neighbouring Wimbledon Park estate, and he decided to restore and extend The Old Rectory, repairing the exterior, transforming the interior, laying out the grounds and planting the famous fig walk. His successor, Samuel Willson, who bought the house for an impressive £6,000 in 1882, carried on the good work, adding the pebble-dashed, two-storey drawing-room wing and installing carved-oak doors and English, Flemish and Italian chimneypieces. Then came marine engineer Matthias Jacobs, who bought The Old Rectory in 1909 and enlarged it considerably with help from his brother, an architect, who designed a new single-storey billiard room, a large service wing to the north and a study extension to mask the chapel. He was followed in 1923 by Thomas Lethaby, who concentrated on embellishing the interior. The drawing room was fitted with oak panelling from the Chantry House, Newark, an elaborate plaster ceiling based on one at Knole, and a grand fireplace. When the Lethabys sold up in 1947, plans to turn The Old Rectory into an old-people’s home failed to materialise, and the house was bought as a family home by Russell Brock (later Lord Brock) for £13,750 in 1953. When the Brock family left in 1978, the kitchen garden was developed for housing as Rectory Orchard, and The Old Rectory was sold to the Iraqi entrepreneur and philanthropist Basil Faidhi. Sub-sequent owners included rock guitarist Brian May, who paid £4 million for the house in 1994. He spent little time there, and The Old Rectory was sold privately, before coming back on the market priced at £16 million in 2006. According to Mark Wilkinson of historic-building architects Donald Insall Associates, who directed The Old Rectory’s latest adaptation on behalf of its current owners, ‘the challenge of the project was to adjust the house to suit contemporary family life, without damaging its intrinsic character. Following the practice of most previous new owners since the mid 19th century, there has been the opportunity to introduce significant new internal fittings and a substantial extension, but this time to also repair and protect surviving historic features. In my view, the interest of the house has been greatly increased as a result of the time spent by the owners in sourcing historic fireplaces and panelling to further enhance the interior, and the outcome now combines scale and history with practicality’. Major alterations carried out under the watchful eye of owner Antonella Carminati-herself a gifted architect who has worked extensively with the Italian Belle Arti and sourced many of the antique materials used in the restoration from historic Italian buildings-included the demolition of an ugly early-20th-century porch, the remodelling and extension of Matthias Jacobs’ billiard room to form the current drawing room, the reinstatement of the original central Tudor courtyard by removing the 20th-century roof, the demolition of an unsightly oak conservatory and the removal of a ‘bilious’ blue swimming pool from the east lawn outside the drawing room. A significant introduction was the construction of a substantial north extension containing a new kitchen and breakfast room with garages underneath, a new rear entrance and an oak staircase leading to the ground floor. Mrs Carminati has thrown herself into every aspect of the project with evident enthusiasm, but, sadly, with her husband’s business interests now mainly concentrated in Asia, they can no longer spend as much time as they would like in their Wimbledon home. Hopefully, a new owner will have time to enjoy this extraordinary house, listed Grade II*, with its 13,000sq ft of luxurious accommodation that includes seven splendid reception rooms, seven bedrooms, a gleaming bespoke kitchen and grounds that were originally laid out by the designer of the gardens at nearby Hampton Court Palace.